When an opportunity presents itself, you can sometimes take it. I always look at my decision to leave my job and travel in South East Asia as an opportunity. I just went into the office one day and thought... I don't want to be here. It's time to leave. The furthest place I had travelled to before was America. I'd had a reasonable budget for this, and it had been a three week holiday. But, I'd always wanted to do the backpacking experience to South East Asia for a longer duration. As my preparation was extensive, it occurred to me that I could share my 'Travelling with a Cochlear Implant. Top 15 essentials' with other travellers like myself. So.....fellow travellers, I hope you find this list useful. Please note, this is not a completed list. Please do contact me if you would like to add to it. Cochlear America describes a MAP as an "individualised listening program.” To get the right MAP can be time-consuming. My processor became active for the first time in 2000. I did monthly visits to the audiologist. They would tweak my processor settings until I finally had a MAP that worked well for me. Having a copy, when travelling, is always useful should you need to visit a nearby Cochlear Implant centre. I research in advance to get the nearest Cochlear Implant centres in the countries I visit. The Cochlear website has this information. There is also email support for advice and information, from my local centre. The Richard Ramsden Centre for Auditory Implants in Manchester UK (United Kingdom). I am always apprehensive about entering airport security gates. I have a fear of triggering the alarm. But also I worry that my processor MAP might disappear should I walk through the gates. The probability of these situations happening is very slim. When travelling, I don’t want to take any risks that might hinder my trip. I always state to a security guard that I have a Cochlear Implant and point to my right ear: the ear where my processor is. I then show security my Cochlear Implant travel card. It gives them confidence that I have a valid reason for a body search. The card is sometimes known as a Patient Validation Card. You can download this from Cochlear’s website. I also signed as a family member with Cochlear, and they sent me a plastic card which fits in my wallet. Advanced Bionics ensure that you receive a Patient Identification Card after your operation. A replacement card is also available by contacting them. MED-EL provides a Patient Identification Card. Please click here to download. An annual cover plan designed for those who travel often and a single trip plan with a family option. If your processor gets lost or damaged, they will ship a temporary replacement out as a priority. A full backup plan in which you have a backup processor ready before you leave home. A courier cannot always deliver to remote countries. This plan proves useful in this respect. Advanced Bionics run a scheme called ‘Holiday Loaner Program.’ They allow you to borrow a processor, cable, and headpiece to take with you on your holidays for extra peace of mind. The cost is $80 for a kit for one ear or $160 for a kit for both ears. There are terms and conditions to take into account before committing to this program. Advanced Bionics recommend that you contact them to find out more. MED-EL run a holiday loan program also. Their plan has changed recently, and there is not much information available on the changes. As a starting point, you are recommended to contact them. Listening to music: I plug the audio jack to my iPod Classic and then into the socket in the wireless microphone. A quick push of my processor button. I then sync with the microphone and listen to my travelling tunes! Skyping: I perform the same actions as above, but I plug the audio jack into my laptop and load up Skype. Movies and television catch-ups: Life on the road involves a lot of bus, plane and boat journeys. On one long boat trip, I went to the deck outside and set up my laptop, hard drive and mini microphone on a deck bollard! I then proceeded to watch Game of Thrones episodes back to back. The Mini Microphone is very discreet in that no-one else can hear what I can hear! Meeting locals and other travellers: Life on the road, as a solo traveller, is never lonely. Along the way, you will encounter communication obstacles. You will meet people who are difficult to understand. You will be in noisy environments conversing, and it will be a struggle. I would ask people to clip on the mini microphone so that I could enjoy a more relaxed conversation with them. Indeed, as a result, I became a very active confident listener. Unfortunately, Cochlear are no longer producing the Mini Microphone They released the Mini Microphone 2 and Mini Microphone 2+ recently. I have not tested these, for communication purposes. So, I cannot comment on their usefulness. MED-EL provide the Phonak Roger Pen with their patient kits. The Roger Pen is an expensive piece of kit. So, it’s heartening to see it offered for free. I haven’t tested the Roger Pen but MED-EL claim that ‘this sleek wireless microphone helps deliver speech understanding in noise and over distance.’ Together with the Roger X receiver, it features adaptive wireless transmission, fully automated settings, wideband audio Bluetooth for cell phone use, TV connectivity and an audio input for multimedia use. The nearest equivalent that Advanced Bionics have to the Cochlear Mini Mic is the Phonak Remote Mic but you also need the Phonak ComPilot for this to work. This setup works with the Naída CI Q70 Advanced Bionics processor. It’s not the most cost-effective solution as you have to buy two products. Overall. the Roger Pen together with the Roger X receiver works with most Cochlear Implant processors. Just make sure you purchase the correct Roger X receiver! Portable battery packs are a form of mobile power supply. They provide convenient mobile charging for devices. The rechargeable mini microphone battery life is short. But, I also used my battery pack to charge other essentials such as my mobile phone, iPod, and Kindle. I recommend the Anker PowerCore 15600 mAh Super High Capacity Battery Pack Power Bank. Anker PowerCore 15600 mAh Super High Capacity Battery Pack Power Bank. Yes, it’s a little on the heavy side, and it takes a while to charge. But, it’s an absolute beast in terms of power. It charges your devices quickly. Its longevity is excellent. I have had mine now for two years, and it’s still performing efficiently and effectively. Please see the Amazon US website for the portable battery pack and the Amazon UK website for the portable battery pack. Some climates are hot and humid, and you will sweat a lot. Ear Gear is a means of protecting your processor from dirt, sweat and accidental loss. It is not a waterproof solution. But, the double wall nylon-spandex blend is both washable and durable. It is a universal design for all Cochlear Implant processors. Please see the Amazon US website for Ear Gear and the Amazon UK website for Ear Gear. How to install Ear Gear onto a Cochlear Processor. When travelling, I take part in strenuous activities. These would entail sports such as tennis and squash. I would also join social groups and do the local walks. To keep my processor in place, I used a Cochlear Implant headband as well as the Ear Gear. A great headband that I use is the Cochlear Implant Comfort Headband by HearBand. It’s very comfortable and made from a stretchy cotton-elastane which is washable. Please see the Amazon US website for the headband and the Amazon UK website for the headband. To combat moisture build up in the processor, I use the unit every night. Every two months I replace the dry brick in the unit. The unit helps to maintain processor performance. It also helps to reduce repairs and to enjoy better sound quality. It is relevant to all Cochlear Implant Processors. Please see the Amazon US website for Dry and Store Unit and the Amazon UK website for Dry and store unit and dry bricks. The coil is the bridge between the sound processor and the Cochlear Implant. It receives electronic information from the sound processor. It turns it into signals which are received by the implant. In the past, my Nucleus Six coil cable did fail. It’s important to have this as a backup. Cochlear do a variety of coils specific to each processor. Make sure that you order the correct replacement coil. 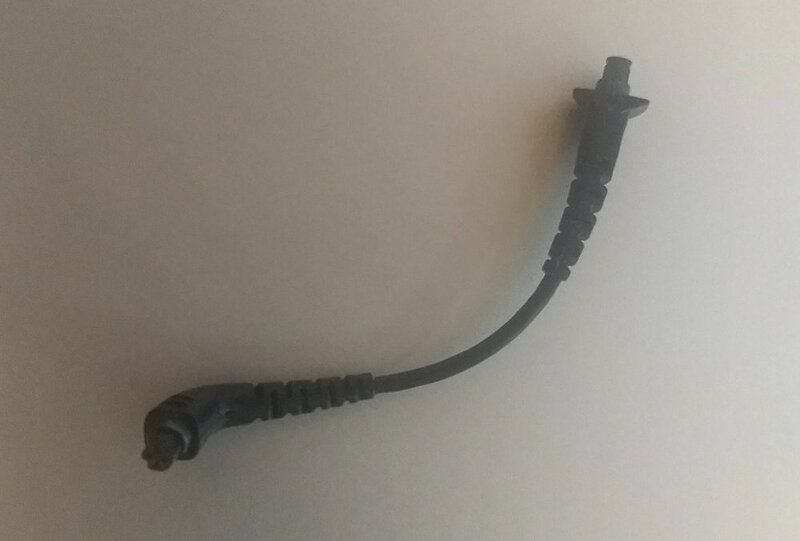 Advanced Bionics do a similar product called a headpiece cable. You can find this cable in their accessories guide. MED-EL also sell coil cables. Check out their online shop to see these products. There are only so many batteries you can carry in a backpack or suitcase. Rechargeable batteries are less damaging and safer. The charger base made by Cochlear that I have has four battery docks. I have four rechargeable batteries which last a day each. Advanced Bionics sell a battery charger and rechargeable batteries at their website. MED-EL have a user friendly guide on their battery charging process at this link. The Cochlear Snugfit fits over my ear and around my earlobe. My processor attaches to it. You could describe the Snugfit as a modern looking ear hook. The upper and lower ear hooks adjust for a more secure fit. It is an excellent accessory. The Snugfit gives me confidence that my processor won’t fall off. It is particularly useful when participating in more strenuous activities such as hiking. Advanced Bionics provide a number of wearing options. MED-EL have a page about their fixation options. These are to protect the sound processor’s microphones from dirt and moisture. They have to change every three months or sooner if you live in a high humidity environment. Before travelling, I always ensure that I have the correct amount packed. They are available on the Cochlear website. Advanced Bionics sell what are known as Microphone covers. These are available in their accessories brochure. Information about MED-EL microphone covers is available here. It's an excellent and innovative accessory. I place the silicon coating over my processor, and I change the coil. My processor is then waterproof, and I can swim and hear at the same time! Advanced Bionics offers a similar product called the AquaCase Enclosure. They also sell the world’s first and only waterproof sound processor called the Neptune. Please click this link to find out Advanced Bionics Water Innovations. MED-EL offers the WaterWear for all their processors. If you’re like me, a deep sleeper, then having a good travel alarm clock is essential. My recommendation is the Sonic Alert Loud Bedside and Travel Clock with Vibrating Shaker Pad. You can customise the clock to suit your needs. It has a sound setting for people with hearing loss. I set the sound setting to ‘off’ and rely on the vibrations to wake me up. View this product on the Amazon US website or the Amazon UK website. I use a Cochlear Storage Case for compact equipment. The case contains my accessories such as the Aqua plus, rechargeable batteries, spare coil cables and microphone protectors. Sign up to the MED-EL shop to get their travel case. Advanced Bionics offer carrying cases for their range of processors. You can sign up to their shop to view these. It’s possible when travelling that your Daypack might be over the airline weight specifics. If questioned when checking in, I show my Cochlear Implant card to airline staff. To date, I've not had problems in this approach. But, to avoid any additional fees, many airline websites allow you to factor in medical luggage additions. If in doubt, you can email the airline in advance. Having a good Daypack is essential. When I used transport for long distance travel, I carried my Daypack. It contained my Cochlear Implant gear and other essentials such as my laptop. My Backpack would go in the hold. When I stayed in a hostel, I stored my Daypack in a locker. It has a capacity of 20 litres. It’s spacious, comfortable, robust and reliable. The zip has a hole to insert a small padlock. View on the Amazon US website or the Amazon UK website. For day trips, sightseeing and social events, I use my Nike Brasilia Gymsack. It has ample storage space. It’s comfortable and has a handy zip for you to keep your phone safe. View on the Amazon US website or the Amazon UK website. I purchased two padlocks for travelling. I used one for my Daypack and one for my Backpack. I used a high-security padlock called the Titan Pickproof 4-Dial TSA Accepted Combination Padlock. View on the Amazon US website or the Amazon UK website. Titan Pickproof 4-Dial TSA Accepted Combination Padlock.